I will be the featured reader at the September Session reading from Jewtown and maybe one or two new poems. Representing a new generation of voices in Irish literature, meet Stephen Connolly, Stephen Sexton, Caroline Bracken and Simon Lewis. St. Mary’s College professor Raina Leon moderates the session, helping us examine how a writer’s work reflects the dynamic and diasporic experiences of nostalgia, resistance, and home connectedness, through language that defies erasure of self, and dares us all to act. I'll be one of the featured readers at the popular Over the Edge Readings in Galway City Library. More details to follow. 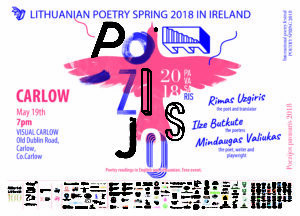 I will be reading with Lithuanian poets Rimas Uzgiris, Ilze Butkute and Mindaugas Valiukas on May 19th in VISUAL Carlow along with Derek Coyle (poetry) and Colm Broderick (uileann pipes). This is the first time I will be reading by poems to a Lithuanian group, which will include the Lithuanian ambassador to Ireland. I'll be reading with the Carlow Writers' Co-op supporting the poets Maurice Devitt, Jane Clarke, Mark Roper and Grace Wells as part of the Carlow Arts Festival. I will be reading with the Carlow Writers' Co-operative supporting Pat Parkes who will be in Ireland to launch his novel. 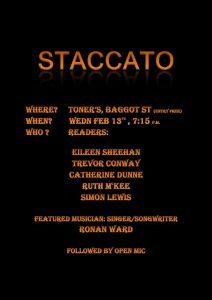 I'll be reading at STACCATO with Eileen Sheehan, Trevor Conway, Catherine Dunne and Ruth McKee on 13th Febraury in Toner's Pub, Baggot Street. Things kick off at 7:15pm.